Claire Toynton, who has just gained a First in her BSc (Hons) Baking Technology Management degree at LSBU, has been awarded a Rising Star Award in recognition of her volunteering efforts and numerous internship placements at ingredient companies, bakers, patisseries and millers. The Baking Industry Awards recognises the skills and achievements of bakers and related trades through a number of categories, including; the Rising Star Award, Baker of the Year, Outstanding Contribution to the Baking Industry and Bakery Manufacturer of the Year. 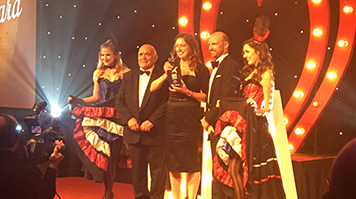 The Rising Star Award received by Toynton in front of more than 800 industry guests at London’s Park Lane Hilton, recognises high achievers who have demonstrated talent and commitment to the industry. “I’m absolutely delighted; I definitely didn’t expect to win. It’s such a massive honour to have industry professionals such as Piero Scacco and David Powell think you deserve such an accolade. I really hope I will do them proud in the future. “I had always known about the Baking Industry Awards but never felt confident enough to enter. This year our Course Director, Elaine Thomson, suggested I apply, I did and I got shortlisted to the final 3 and won! “The awards ceremony was fantastic. I was nervous about being called on to stage with the other nominees, but to then find out I’d won was so overwhelming all I could think about was walking up and not tripping over!" Read more about Claire Toynton’s path into baking and her experience at LSBU. Find out more about the National Bakery School.